American test pilot astronaut 1987-2006. Status: Inactive; Active 1987-2006. Born: 1956-11-14. Spaceflights: 5 . Total time in space: 211.59 days. Birth Place: Portsmouth, Virginia. Grew up in Bedford, Indiana. US Navy Test Pilot prior to astronaut selection. PERSONAL DATA: Born November 14, 1956, in Portsmouth, Virginia, but considers Bedford, Indiana, to be his hometown. EDUCATION: Graduated from Bedford High School, Bedford, Indiana, in 1974; received a bachelor of science degree in aerospace engineering from the United States Naval Academy in 1978, and a master of science degree in mechanical engineering from Columbia University in 1979. EXPERIENCE: Bowersox received his commission in the United States Navy in 1978 and was designated a Naval Aviator in 1981. He was then assigned to Attack Squadron 22, aboard the USS Enterprise, where he served as a Fleet A-7E pilot, logging over 300 carrier arrested landings. Following graduation from the United States Air Force Test Pilot School at Edwards Air Force Base, California, in 1985, he moved to the Naval Weapon Center at China Lake, California, where he spent the next year and a half as a test pilot flying A-7E and F/A-18 aircraft until advised of his selection to the astronaut program. NASA EXPERIENCE: Selected as an astronaut candidate by NASA in June 1987, Bowersox completed a one-year training and evaluation program in August 1988. He held a variety of assignments since then including: flight software testing in the Shuttle Avionics Integration Laboratory (SAIL); Technical Assistant to the Director of Flight Crew Operations; Astronaut Office representative for Orbiter landing and rollout issues; Chief of the Astronaut Office Safety Branch; Chairman of the Spaceflight Safety Panel; during several Shuttle missions he served as a spacecraft communicator (CAPCOM) in the Houston Mission Control Center; was back-up to the first International Space Station crew; and served as the Director, Flight Crew Operations Directorate. A five flight veteran, Bowersox logged over 211 days in space including 2 EVAs totaling 13 hours and 17 minutes. He was the pilot on STS-50 (1992) and STS-61 (1993), spacecraft commander on STS-73 (1995) and STS-82 (1997), and most recently served as Expedition-6 Crew Commander for 5-1/2 months aboard the International Space Station (2002-2003). Bowersox retired from NASA and the U.S. Navy in December 2006. SPACE FLIGHT EXPERIENCE: STS-50, June 25-July 9, 1992, was the first flight of the United States Microgravity Laboratory and the first Extended Duration Orbiter flight. Over a two-week period, the STS-50 flight crew aboard Space Shuttle Columbia conducted a wide variety of experiments relating to materials processing and fluid physics in a microgravity environment. STS-61, Dec. 2-13, 1993, was the Hubble Space Telescope (HST) servicing and repair mission. During the 11-day flight, the HST was captured and restored to full capacity through a record five space walks by four astronauts. STS-73, Oct. 20 to Nov. 5, 1995, was the second flight of the United States Microgravity Laboratory. The mission focused on materials science, biotechnology, combustion science, the physics of fluids, and numerous scientific experiments housed in the pressurized Spacelab module. STS-82, Feb. 11-21, 1997, was the second Hubble Space Telescope (HST) maintenance mission. During the flight, the crew retrieved and secured the HST in Discovery’s payload bay. In five space walks, two teams installed two new spectrometers and eight replacement instruments, as well as replacing insulation patches over three compartments containing key data processing, electronics and scientific instrument telemetry packages. Following completion of upgrades and repairs, HST was boosted to a higher orbit and redeployed. Expedition-6, Nov. 23, 2002 to May 3, 2003. During 5-1/2 months aboard the International Space Station, the crew worked with numerous U.S. and Russian science experiments. Bowersox and ISS Science Officer Don Pettit performed 2 EVAs (spacewalks) to continue the external outfitting of the orbital outpost. The Expedition-6 crew launched on STS-113 Space Shuttle Endeavour and returned to Earth on Soyuz TMA-1. Born November 14, 1956, in Portsmouth, Virginia, but considers Bedford, Indiana, to be his hometown. Married to the former Ann C. Flatley of Pleasanton, California. They have two children. Graduated from Bedford High School, Bedford, Indiana, in 1974; received a bachelor of science degree in aerospace engineering from the United States Naval Academy in 1978, and a master of science degree in mechanical engineering from Columbia University in 1979. Bowersox received his commission in the United States Navy in 1978 and was designated a Naval Aviator in 1981. He was then assigned to Attack Squadron 22, aboard the USS Enterprise, where he served as a Fleet A-7E pilot, logging over 300 carrier arrested landings. Following graduation from the United States Air Force Test Pilot School at Edwards Air Force Base, California, in 1985, he moved to the Naval Weapon Center at China Lake, California, where he spent the next year and a half as a test pilot flying A-7E and F/A-18 aircraft until advised of his selection to the astronaut program. He has logged over 4,000 hours flight time. Selected as an astronaut candidate by NASA in June 1987, Bowersox completed a one-year training and evaluation program in August 1988. He has held a variety of assignments since then including: flight software testing in the Shuttle Avionics Integration Laboratory (SAIL); Technical Assistant to the Director of Flight Crew Operations; Astronaut Office representative for Orbiter landing and rollout issues; Chief of the Astronaut Office Safety Branch; Chairman of the Spaceflight Safety Panel; during several Shuttle missions he served as a spacecraft communicator (CAPCOM) in the Houston Mission Control Center. A four flight veteran, Bowersox has logged over 50 days in space. He flew as pilot on STS-50 in 1992 and STS-61 in 1993, and was the spacecraft commander on STS-73 in 1995 and STS-82 in 1997. STS-50, June 25-July 9, 1992, was the first flight of the United States Microgravity Laboratory and the first Extended Duration Orbiter flight. Over a two-week period, the STS-50 flight crew aboard Space Shuttle Columbia conducted a wide variety of experiments relating to materials processing and fluid physics in a microgravity environment. This was the longest Shuttle flight on record, allowing him to log over 331 hours in space. STS-61, December 2-13, 1993, was the Hubble Space Telescope (HST) servicing and repair mission. During the 11-day flight, the HST was captured and restored to full capacity through a record five space walks by four astronauts. After having traveled 4,433,772 miles in 163 orbits of the Earth, the Space Shuttle Endeavour and her crew returned to a night landing on the runway at the Kennedy Space Center in Florida. STS-73, Oct. 20 to Nov. 5, 1995, was the second flight of the United States Microgravity Laboratory. The mission focused on materials science, biotechnology, combustion science, the physics of fluids, and numerous scientific experiments housed in the pressurized Spacelab module. In completing his third space flight, Bowersox and his crew orbited the Earth 256 times, traveled over 6 million miles, and logged a total of 15 days, 21 hours, 52 minutes and 21 seconds in aboard Space Shuttle Columbia. STS-82, Feb. 11-21, 1997, was the second Hubble Space Telescope (HST) maintenance mission. During the flight, the crew retrieved and secured the HST in Discovery's payload bay. In five space walks, two teams installed two new spectrometers and eight replacement instruments, as well as replacing insulation patches over three compartments containing key data processing, electronics and scientific instrument telemetry packages. Following completion of upgrades and repairs, HST was boosted to a higher orbit and redeployed. Mission duration was 9 days, 23 hours, 37 minutes, traveling 3.8 million miles in 149 Earth orbits. Family: Astronaut. Country: USA. Spacecraft: ISS. Flights: STS-50, STS-61, STS-73, STS-82, Soyuz TM-31, Soyuz TMA-1 ISS EP-4, STS-113 ISS EO-6. Projects: STS. Agency: USN. Bibliography: 12, 5194. 1956 November 14 - . Birth of Kenneth Duane 'Ken' Bowersox - . Nation: USA. Related Persons: Bowersox. 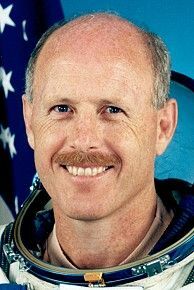 American test pilot astronaut 1987-2006. 5 spaceflights, 211.6 days in space. Flew to orbit on STS-50 (1992), STS-61, STS-73, STS-82, STS-113..
2003 January 15 - . 12:50 GMT - . EVA ISS EO-6-1 - . Crew: Bowersox, Pettit. EVA Duration: 0.29 days. Nation: USA. Related Persons: Bowersox, Pettit. Program: ISS. Flight: STS-113 ISS EO-6. The spacewalk was originally planned for December 12 and a crew of Budarin and Bowersox. But Budarin was prohibited by NASA from further EVA's (at least using US spacesuits) for undisclosed medical reasons. It took over a month for the plans for the spacewalk to be revised (since Budarin was not qualified to operate the space arm, Petit and Bowersox would have to move around the outside of the gigantic station without its assistance). They deployed the 23 m high central radiator panel on the P1 struss, cleaned up a docking port, installed external lighting on the S1 truss, and retrieved tools left on the Z1 truss. 2003 April 8 - . 12:40 GMT - . EVA ISS EO-6-2 - . Crew: Bowersox, Pettit. EVA Duration: 0.27 days. Nation: USA. Related Persons: Bowersox, Pettit. Program: ISS. Flight: STS-113 ISS EO-6. The Quest airlock was depressurized at 1236 GMT. Cosmonaut Budarin supported the operations from inside the station. One of the more important tasks was to reroute power cables for two of the station's critical control moment gyros, so that the pair could not be disabled by any single power disruption. This was important to provide extra redundancy, since one of the four total gyros has already failed and could not be replaced due to the grounding of the shuttle fleet after the STS-107 disaster.